Growing up in the metropolis of Herculaneum, I grew accustomed to the aromatic smell of the world's largest lead smelter. There was nothing like football practice in August and the lead smoke being so thick in the air it looked like fog. I guess it just made our lungs tougher. 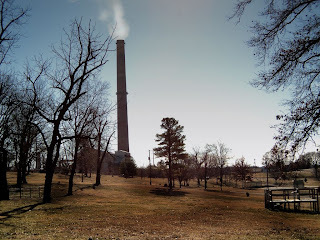 Since then the "old" smokestack has been torn down and the "new" one built. They have also torn down almost every house in that part of town due to contamination. This is a view of the smokestack from behind Herculaneum High School. The entire area in this picture was filled with homes while I was growing. I played countless innings of wiffle ball in these yards. Take the Guns. Is that the Answer?